To those who live in the windowless House of Theory, Wynn Thomas’ collected essays will seem irredeemably old-fashioned. Here, far from being dead, the author is very much alive, a thinking, feeling individual who creates not ‘texts’ but poems, novels, stories, emanating from experience in quite specific milieux that can be explored to throw light on what they wrote. Moreover, instead of writing with a kind of arrogant obscurity, Wynn Thomas writes with elegance and clarity. As a result, these essays are a pleasure to read in themselves and deserve an audience beyond academia. In his Introduction, he builds on the distinction made by Michael Cronin between the ‘macrocosmopolitan’ and the ‘microcosmopolitan’. The macrocosmopolitan (read here London) assumes that only in the larger centres of cultural power is it possible to be truly cosmopolitan. Cronin argues, however, that ‘the same degree of diversity is to be found at the level of entities judged to be small or insignificant as at the level of large entities.’ The relevance of this to Wales is obvious. It is a key concept behind these essays, enabling Wynn Thomas to write about Welsh writing in English confidently, with no hint of ‘cultural cringe’. Thomas is essentially a literary historian, most at ease with the Complete Works of an author which can be examined at a suitable remove. The one exception in All That Is Wales is Gillian Clarke, but even here he limits himself to her early poetry, a body of work that is discrete and contained in the past. He excels at a kind of literary archaeology, as when he discusses the creative tension between Lynette Roberts’ life in Llanybri, Carmarthenshire, and her very different experience of growing up in Argentina. Borrowing the term ‘participating outsider’ from sociology, he shows how her engagement with Wales through the prism of her Argentinian background (where she was a participating outsider of another kind) made her into the poet she was. 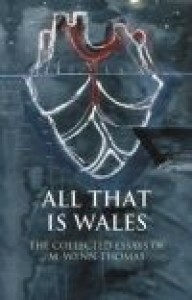 All That Is Wales contains two outstanding essays on RS Thomas which analyse the poet’s fraught relationship with the Church in Wales at the beginning and at the end of his career as a priest. Wynn Thomas points out that ‘RS’ was among the first priests in the Disestablished Church, and that he himself had a ‘disestablished mentality’ which brought him into increasing conflict with a Church that was still very Anglocentric. In the process, long-forgotten controversies in the Church magazine, Y Llan, are excavated which throw intriguing light on the poet’s disillusionment and the ways in which his attitude to the Church fed into the poetry from the start. M Wynn Thomas is good, too, on the re-evaluation of writers who have fallen by the wayside, such as Nigel Heseltine, discussing him as a border writer whose stories reflect the diminished world of the once powerful mid Wales gentry. I would question, though, the Welshness of Heseltine’s one published collection, Tales of the Squirearchy, which seems to me indebted stylistically to Saki and Ivy Compton Burnett, writers whose distinctive Englishness permeates Heseltine’s stories as a result. In the Introduction, Wynn Thomas allows himself an element of autobiography to explain how he became the kind of critic he is. He almost apologises for this uncharacteristic intrusion of the personal. It is, however, fascinating, and makes one wish for a book-length memoir by one of our finest critics. John Barnie’s latest book is a collection poems, Wind Playing with a Man’s Hat (Cinnamon Press). A new collection, Departure Lounge, also from Cinnamon, will appear in 2018. Barnie’s essay collection of 1989, The King of Ashes (Gomer), won the Arts Council of Wales’ Book of the Year award. Entries are now open in the New Welsh Writing Awards 2018: Aberystwyth University Prize for an Essay Collection. The word-limit is 5000 for a minimum of two essays on an open theme, entries close on 1 February, and first prize is £1000 as an advance on an ebook deal.